This great peg solitaire jumping game helps develop visualization skills, step by step thinking, directionality, spatial relations and fine motor control. 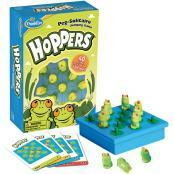 Comes with 40 pattern cards, 12 frogs and 4" x 4" play tray, which slides back revealing storage space for all pieces. Play by placing frogs on pond as shown on cards. Then start jumping until only one is left. Lots of fun for many levels of players. Somewhat less challenging than Hi-Q.